One of the children's favourite games is pretending to be any one of their animals from the zoo or wildlife. So I was so excited to surprise them with a Jungle Dogs day at Longleat Safari Park. 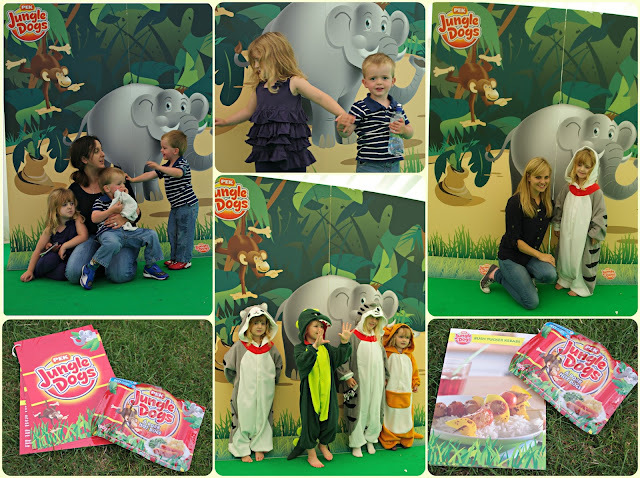 We were invited to find out more about Jungle Dogs, a new product marketed as a healthy approach to Hot Dogs. And herein lies the truth. The children love sausages and hot dogs. It would be great if they would only eat chicken breasts, gammon and beef, but the truth is it still takes them far too long to chew through it to enjoy their food. Instead they enjoy spaghetti bolognaise, lasagne, sausage pesto pasta, chicken nuggets and of course when they get their hands on Hot Dogs, well their plate is empty in five to zero countdown! We arrived at Longleat and made our way to a special marquee where the lovely peeps from Jungle Dogs welcomed us and we were delighted to meet the Jungle Dogs Ambassador, Tina O'Brien (although I completely admit to smiling, saying 'hello', distracting a child and thinking "Which blog do I know her from?". Absolute DUH! As well as getting to play and demonstrate that only my children do not stay still enough long enough to have their photo taken, we also got to try out Jungle Dogs and sampled great ways of incorporating them in meals. Because here's the thing. I'm not going to say eating hot dogs makes a great diet. I'm going to say what I always say- everything in moderation. Having parented a really fussy eater until she turned three, and managing barely to survive two boys who woke up one day having apparently decided they no longer ate purees only solids, I'm ok with going with what works. I'm now happy that my little girl demands vegetables and fruit as part of her favourite meals. I'm happy that the boys are human dustbins, and may not eat very well one day but will be vacuum cleaners the next. And I'm happy that food should have a treat element. That understanding that they are having food for treats can be recognition for good behaviour, and special occasions. On the day Squeaks was off colour, and I was gutted she could not make the most of such a special day. The boys, well the boys were on human dustbin duty. They loved Jungle Dogs, and once they had polished off the ones set nicely on our table they set their minds on opening the packets and eating them as well! We really enjoyed the meal ideas which were presented. I loved the idea of kebabs, the boys weren't as keen on them, but in fairness they weren't vegetables they usually eat, but I think this would be a fab, hands on approach to getting them involved in making their own food, if we included things like tomatoes and broccoli, and left them to assemble their own food. I also loved the idea of incorporating them in sandwiches, and have been off ordering cutters as the boys loved them and we can add lettuce, cucumber and tomato. And the favourite of mine from the recipe book would definitely be using the hot dogs on cheese and tomato pizza! Most pizza places offer smiley face pizzas and it's never occurred to me to create our own. We can incorporate sweetcorn for hair and mushrooms for ears for a bit more variety, and again we can get the children involved in preparing their own food. 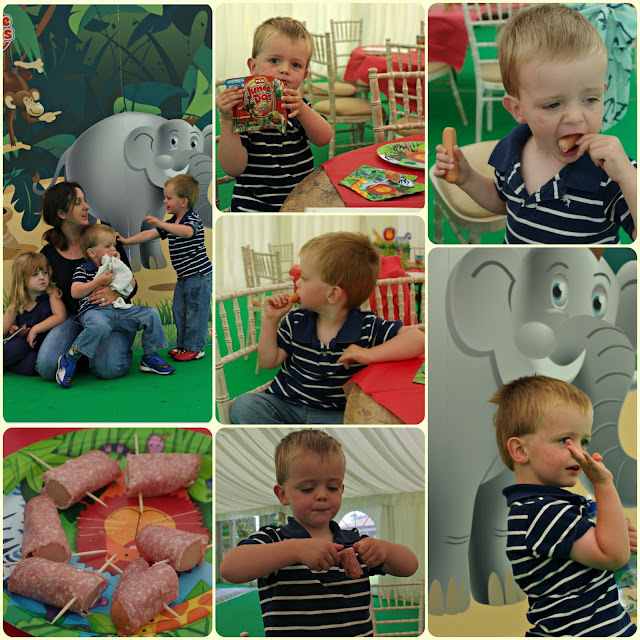 After lunch with Squeaks under the weather and the boys ready for their nap we took the opportunity to take a drive round the Safari Park, and of course because the children were napping on shifts we ended up going round twice. It was absolutely fantastic! We loved the monkeys the most. And fortunately had much merriment watching the little rascals taking their favourite bits of some of the cars, and whilst we picked up a few hitchhikers fortunately they didn't find anything on our car to take with them. We were all in awe of the tigers and lions. And the boys got to see Annie the Elephant and were very impressed. We're now planning a trip back to Longleat later in the year to make more of a day. And according to Squeaks the boys are having a jungle party when they turn 3 (January!!) because she wants everyone to wear animal onesies! We had a great day out and really love having another something to add to our shopping basket to improve our range of meals which the children will enjoy. Disclosure: We were invited to Longleat Safari Park by Jungle Dogs, and along with complementary entry we received a goodie bag including onesies, Grafix toys and Jungle Dogs. All views and opinions contained in this review are our own.